When I saw the word ‘papercut’ I was a little confused if I’m completely honest! What on earth was a papercut when it didn’t include slicing your finger and crying for days? A quick look on the TwentyFingers website and well, it became obvious! A papercut is basically a cut of an image, sort of like an outline. They print out the cut of paper and then sandwich it between two sheets of glass. I browsed through all the different kinds, but I pretty much knew straight away I’d be going for the Pet Portrait Papercut one. You get to choose which size you want (mine is the standard 10″ x 12″), which colour you want the frame and which colour you want the papercut. I stuck to a white frame with black image because I am a basic blogger haha. 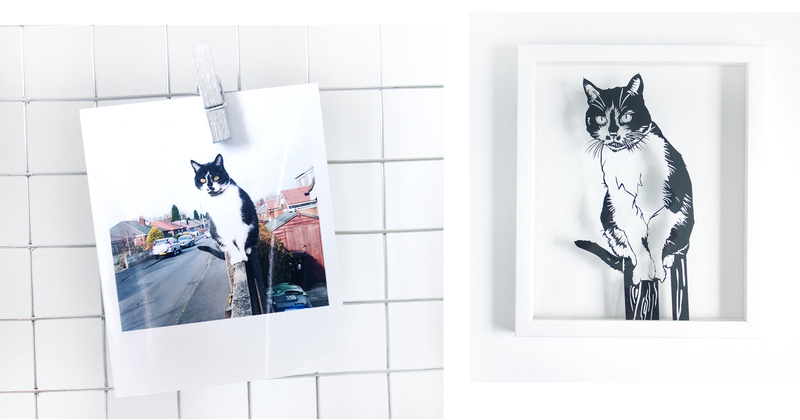 No but really Charlie is a black and white cat, so it only felt right to have her done in black rather than a bright colour, and then I wanted a lighter frame to brighten it up! I uploaded the image I had chosen and simply waited for it to be created. Within a day or two an email had come through with a look at the final design. This was great because I got to check that it was okay, and had the option to change things if necessary. I wasn’t expecting this so it was a nice surprise, and really made the whole order feel a lot more personal. The frame arrived well wrapped in plenty of bubble wrap within a box. It really didn’t take long at all, which is great because after seeing the proof I was so excited to see the final thing! 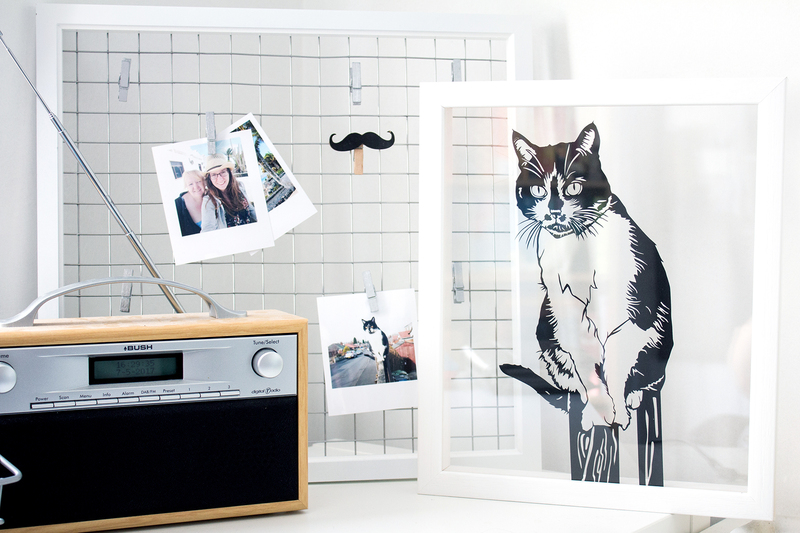 The pet portrait papercut that I chose is priced at £69, and when you receive the item you can tell just how much has gone into it’s creation. The frame feels so tough and sturdy, and the whole thing is actually a lot heavier than I expected. I mean obviously there is glass in there too, so that contributes! It definitely feels high quality though and also comes with a hanging hook on the back so you don’t have to add anything. The clever duo behind Twenty Fingers are a husband and wife team, and they really do create amazing personalised gifts. Items for anniversaries, parents, grandparents, new parents, birthdays and more. Prices range from around £49 – £109 depending on the frame/size and style of print being created. They’re perfect for a special gift to someone, and I’ve got a few things already in mind that I want to order. Ever ordered something like this before? Where are my other crazy cat ladies at?